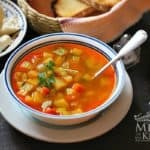 Having grown up in a household where almost every guisado (everyday stews) had lots of vegetables in it, it’s common for me to always add some sort of veggies to my dishes when cooking at home. And this recipe for steaks in green sauce is a good example of it. I know that for some people of other cultures, adding veggies to stews might not be common (especially squash, like in this case), but in Mexico, we can add green beans, fava beans, peas, chayotes, nopales, and even potatoes to stews using a green salsa. Different cooks will add different vegetables (or none at all), depending on the region, the time of year, or their personal preferences. I’ve been receiving several email requests for recipes that take little time to make and are easy to prepare, which is why I think you’re going to love this dish! You can prepare the salsa in advance, and keep it in your fridge until you’re ready to cook. 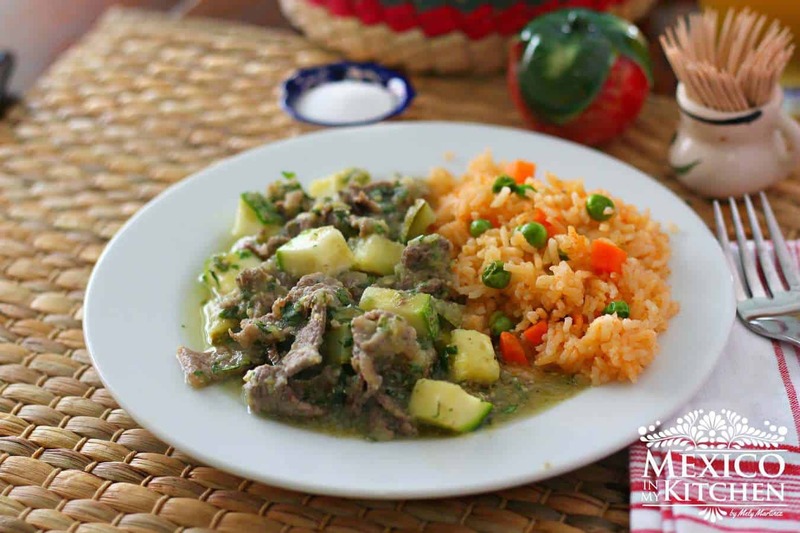 Additionally, since this stew has lots of tomatillos and you can add other vegetables, you only need a side of rice and some warm tortillas in order to have a complete meal, ready in only about a half hour. As I’ve mentioned before in my weekly newsletters, you can freeze the already-cooked rice and reheat it when you’re ready to serve. That way, when you cook these types of dishes, you can spend less time in the kitchen and more time with your family. 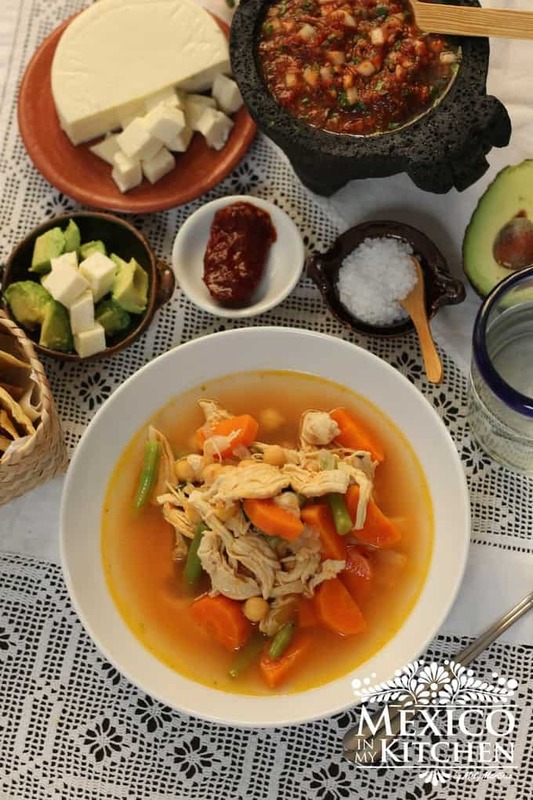 This dish is made all over Mexico, with many variations depending on the region of the country and the season of the year. As to the cut of meat used for this recipe, you can use whatever suits your taste and budget. In Mexico, beef chuck steaks are commonly used (although they might be a little hard to chew). Please, do not forget to read the notes before the recipe instructions. Other options to use instead of squash are green beans, chayote, cooked nopales, and diced potatoes. I know some of you can’t find fresh tomatillos, but if you can find the canned version, that is fine. I also want to note that there is another version of this recipe were the ingredients for the sauce are cooked first and then processed in a blender to form the salsa. You’re going to see a whole Serrano pepper cooking in the sauce in some of the pictures, but that has nothing to do with the instructions given here. It’s something that I do when I cook stews like this for my family. Since I tend to like food spicier than other people, I cook an additional Serrano pepper just for myself and put it on my plate when serving. Heat the oil in a large skillet over medium-high heat. Add the meat and cook for 5 minutes. While the meat is cooking, chop the tomatillos, peppers, onion, and garlic clove. Place them in your blender with ½ cup of water and process to form the sauce. Pour the sauce over the steak and cook for 3 minutes. Once it comes to a boil, reduce the heat. Cut the squash into small cubes and add to the frying pan. Keep cooking until the squash or any other vegetables you added (see notes) are cooked. This will take about 8–12 minutes, depending on the type of vegetables and the size of the cubes. Season to your taste with salt and pepper. Finally, just before serving, stir in the finely chopped cilantro. 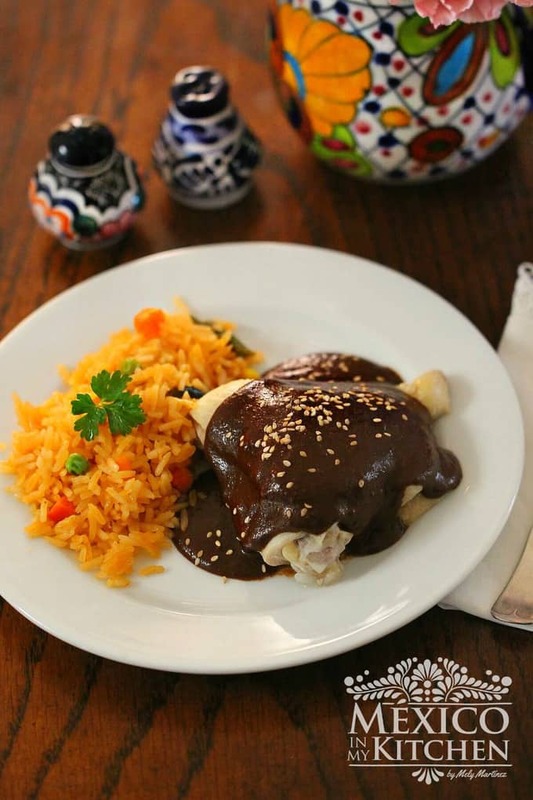 Serve with warm corn tortillas and rice. To prepare this recipe I used a 6″ Chef’s Knife & 10″ Frying pan. Steaks in green sauce with squash, a recipe that will bring dinner to the table in less than 30 minutes. You can use other vegetables to this delicious and loved meal. Cut the steaks into strips that are about ½ inch wide and 1½ inches long. Just make sure that they are bite-sized. Season the meat with salt & pepper. If you like these Steaks in Green Sauce, maybe you will also enjoy the recipe for Pork Ribs in Salsa Verde. This was quite tasty! I make a salsa with the same base ingredients as the sauce so I had to try this recipe. I will be making this regularly. I did add a touch of corn starch to thicken my sauce up some at the end since I don’t think I let it reduce enough. Thank for coming back to comment and for sharing the tip of adding the cornstarch for those that like it a little bit more thick.Provecho! If we want to use potatoes how would we go about that? If you want to add potatoes, use the same amount as the one indicated for the squash-zucchini. Add the diced potatoes to the pan 5 minutes after adding the meat. They need longer to cook. Once they look cooked, then add the salsa. Happy cooking! Hi this was very nice. I have a question what part do you use the onion? You add them with the tomatillos, garlic and peppers to the blender, as it shows on the pictures. Happy cooking! Hi can we use Milanesa meat..
yes, you can. Just don’t use those thin steak for sandwiches.